Two flavorful ice creams swirled into one creamy, fruity frozen heaven! Super easy, eggless berry ice cream for you to try this summer. I probably mentioned this in my previous posts, but I can’t hide my excitement about fresh berries. Today, I’m using fresh strawberries and blueberries to create creamy delightful summer treat. We’re combining two flavorful ice creams into one to get that complex layered flavor burst in each bite. Sure, strawberry ice cream is great on its own, the same holds true for blueberry ice cream. But when you combine the two flavors, you’ll taste the magic. With the first bite, you’ll understand what I’m talking about. This’s the best ice cream for summer time due to its light and fruity fresh flavors. Oh and another reason to love this recipe is we’re not using egg yolks in this recipe, which simplifies the process enormously. The end result is equally delicious, if not more, compared to traditional custard-based ice creams. 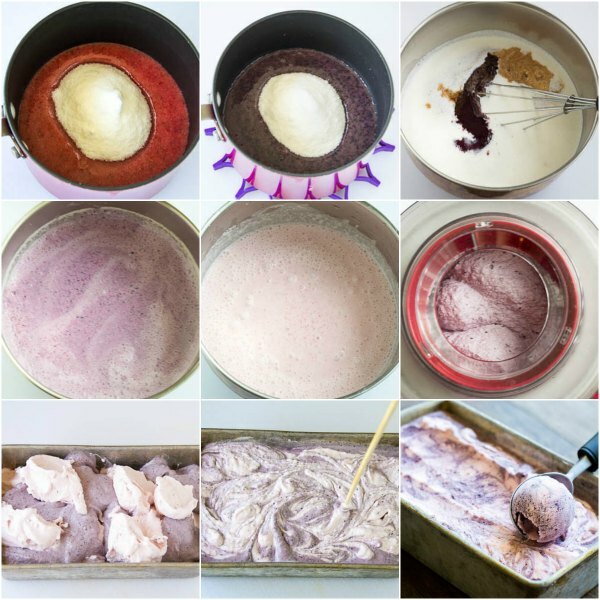 As you usual, here’s step by step visuals for this stunning swirled berry ice cream. 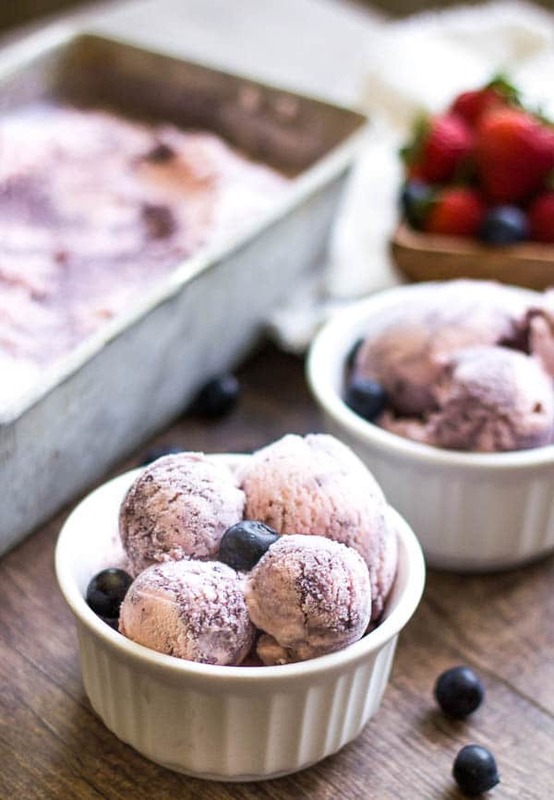 Give this berrylicious frozen treat this summer to cool down at the end of a hot day. This berry ice cream doesn’t disappoint. Happy summer, my friends. Thanks for stopping by! Two flavorful ice creams swirled into one creamy, fruity heaven! 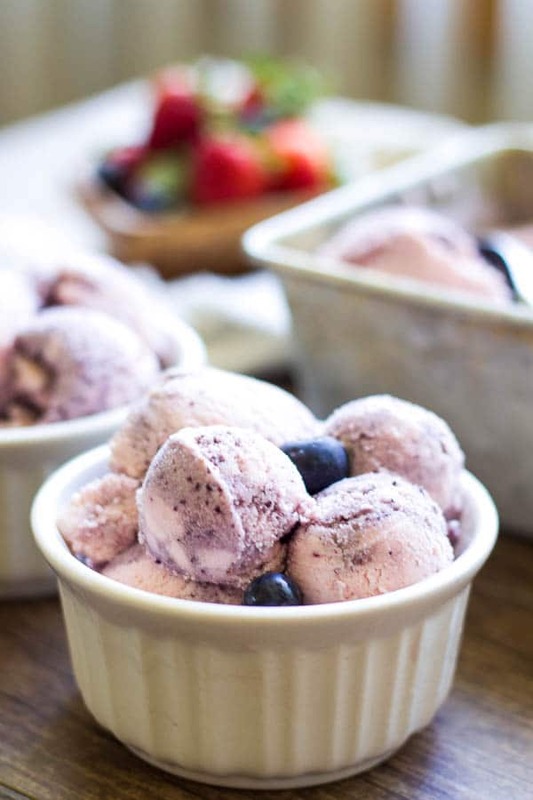 Super easy, eggless berry ice cream for you to try this summer. To make strawberry ice cream, puree the strawberries in a blender or a food processor. In a medium saucepan, combine strawberry puree and sugar. Warm the mixture over medium heat, stirring until sugar is dissolved about 3 minutes. Cool to room temperature. In a large bowl, combine strawberry puree, heavy cream, milk, vanilla extract and salt. Transfer to the ice cream machine and churn according to manufacturer’s instructions. 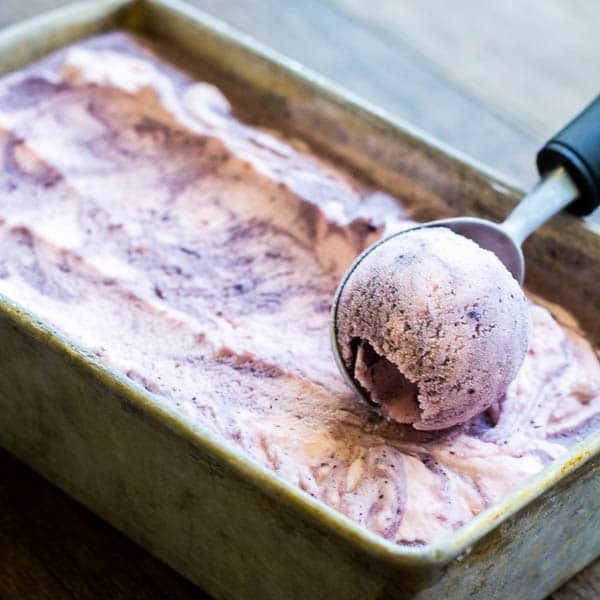 Make the blueberry ice cream exactly the same way as strawberry ice cream. Scoop both ice creams alternating into a sealed container and swirl. Freeze for couple more hours, or overnight, to firm up. This recipe was originally published on June 30th, 2014.